The citizens of Visby had somehow been warned, and had closed the gates. But 1800 peasants prepared to fight for their small country. It is unknown who commanded the Gutnish army. However, he was probably a minor noble of some standing, probably with military experience. The Danish army was composed mainly of Danish and German troops, many mercenaries from the Baltic coast of Germany, with recent experience in the various feuds and wars between the German and Scandinavian states. 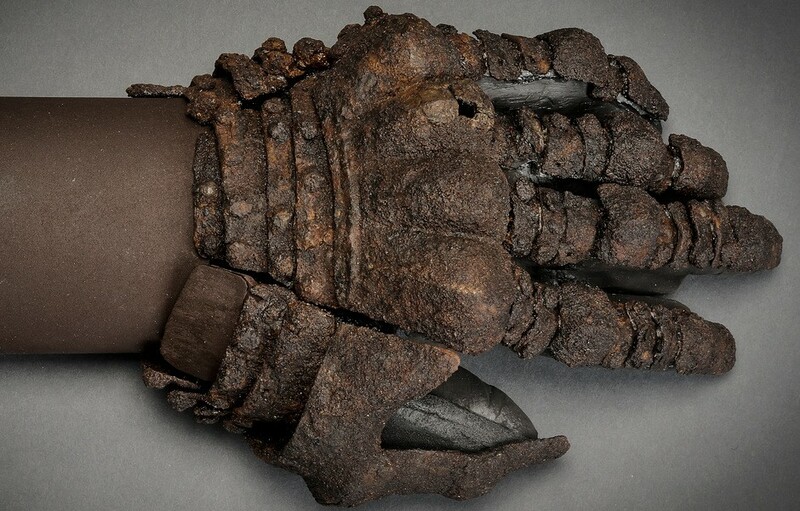 Simple peasants armor found in mass grave near city wall. A legion of Swedish peasants tried to repel the Danish invasion near the city of Visby, but the inexperienced Gotlanders were no match for the Danish soldiers and many of them were slaughtered during the battle. Men, old folk, youths, cripples – they all die in battle outside the city walls of Visby. Their corpses are thrown into mass graves. Nearly 700 years later a mass grave was found on the Island of Gotland and in the years up to 1928 at least three more pits were found. 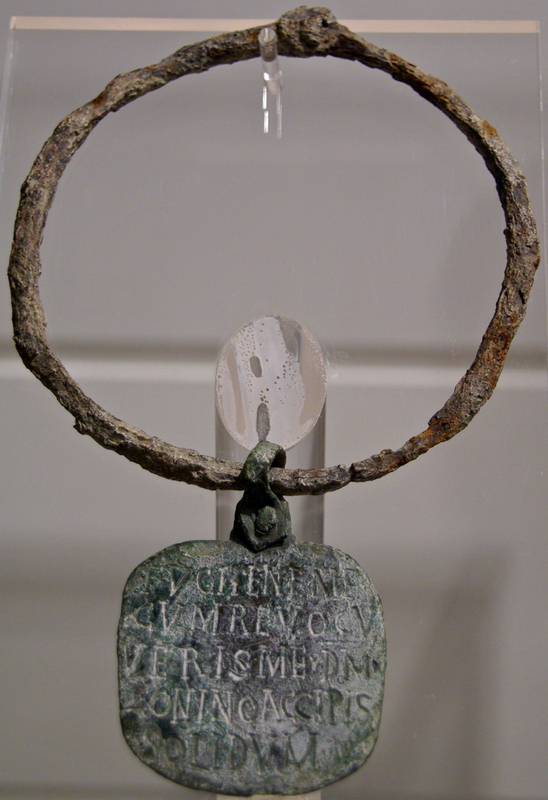 The final ones were found outside the gates of Visby, a walled city. 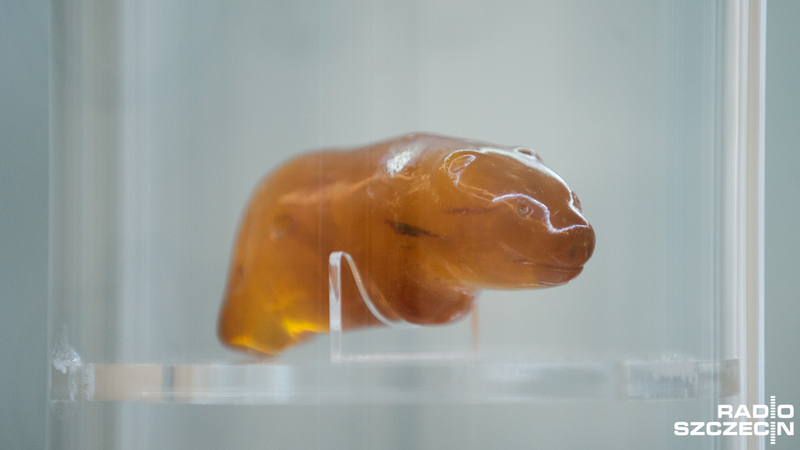 Extensive archaeological investigations of the graves in 1928-1930 and modern science have provided new knowledge of what happened. 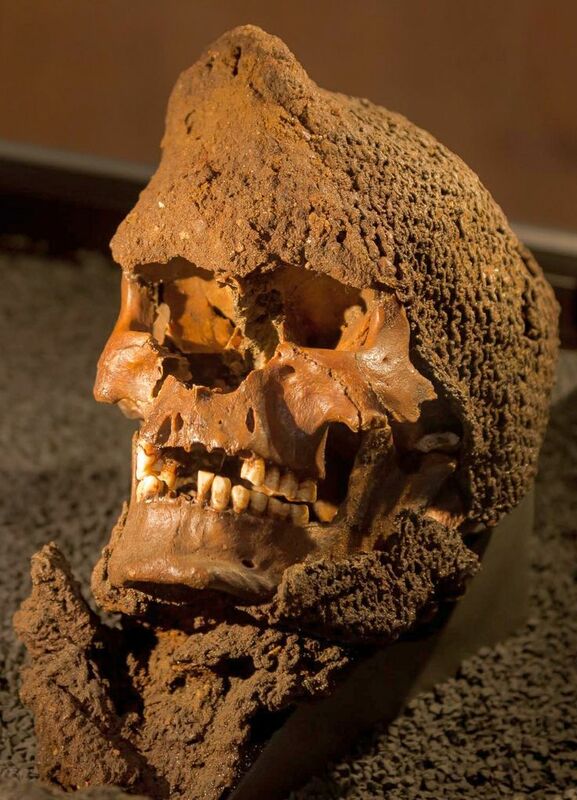 Just a few were found still wearing minor bits of equipment such as skull with the mail coif still in position but many would have been very poorly equipped or armed. Cutting wounds were split into two groups, those which showed hacking evidence but finished at the bone and those which actually severed the bone were 29. For example in more than one case where a single well aimed blow with a sword had been aimed at the upper legs and gone straight through both severing them instantly. Some had evidence of more than one lesser blow before the killer blow was used either in or after the battle. There is one skeleton of a man who has had both legs severed, and it appears to have been done with one blow! The blow landed on the right leg below the knee on the outside, and then struck the left leg slightly below and on the inside. Since it appears to be unreasonable that someone would stand still with one leg hewn off, that one blow cut off both legs below the knee. As can be seen in another section of this book, that is not so astounding after all. There are several skeletons where a foot has been severed, and there are many with cuts to the lower leg. Indeed, this seems to have been a major target. A rough estimate is that close to 70 percent of the blows detected at Visby were aimed at the lower leg. This is quite understandable, as the lower leg is hard to protect, even with a shield. When you consider that these fighters were not well equipped with leg defenses it explains why they were targeted. The head also took many blows. 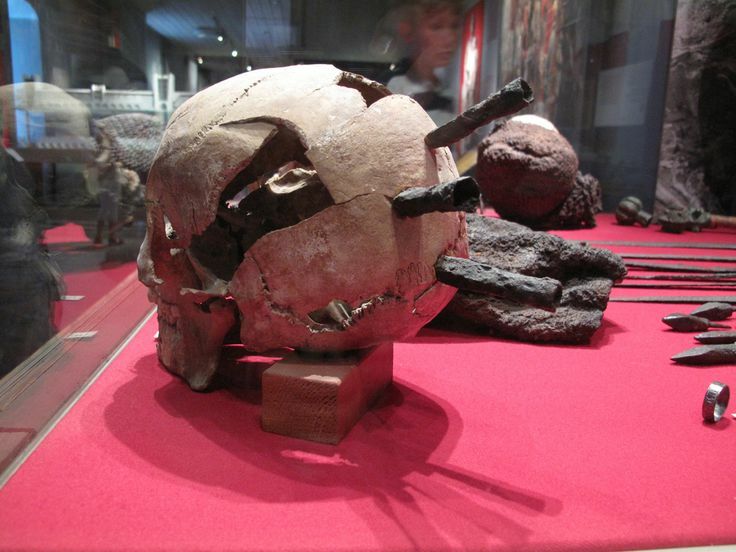 There are several skulls from Visby that received so many blows that you would think the enemy would have gotten tired of hitting the poor devils. Many of the skulls still have their mail hoods, and although the hoods did provide some protection, many of the blows cut through the mail and into the bone. 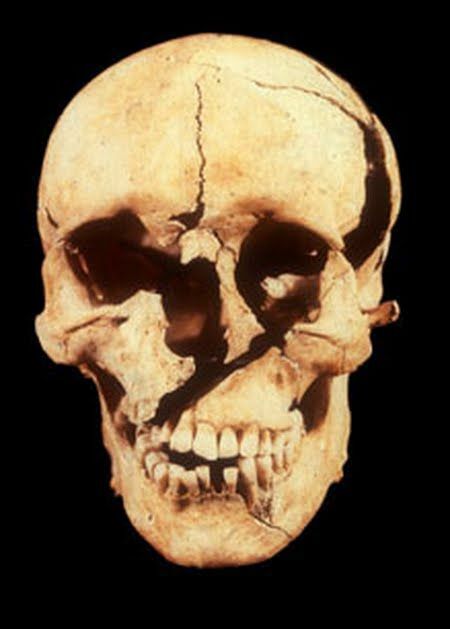 One of the most unsettling skulls is one where the victim had been hit a sharp blow right at the bridge of the nose. The blow was so hard that it cut through the upper jaw. 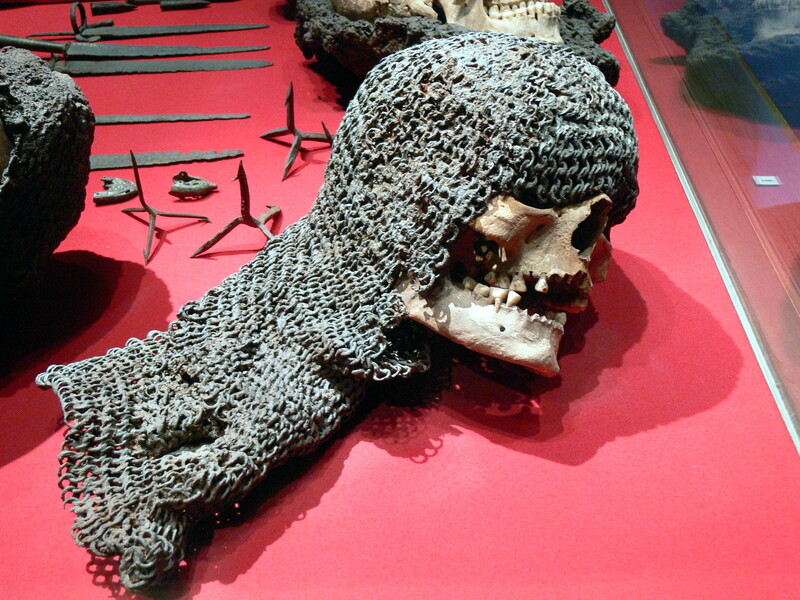 Crushed skull with riveted mail coif from the medieval battle of Visby. There is also a skull from a different battle that shows how brutal the fight were. The Battle of Towton was fought during the English Wars of the Roses on 29 March 1461, near the village of Towton in Yorkshire. It brought about a change of monarchs in England, with the victor, the Yorkist Edward, Duke of York—who became King Edward IV. 28 000 men died that one day. 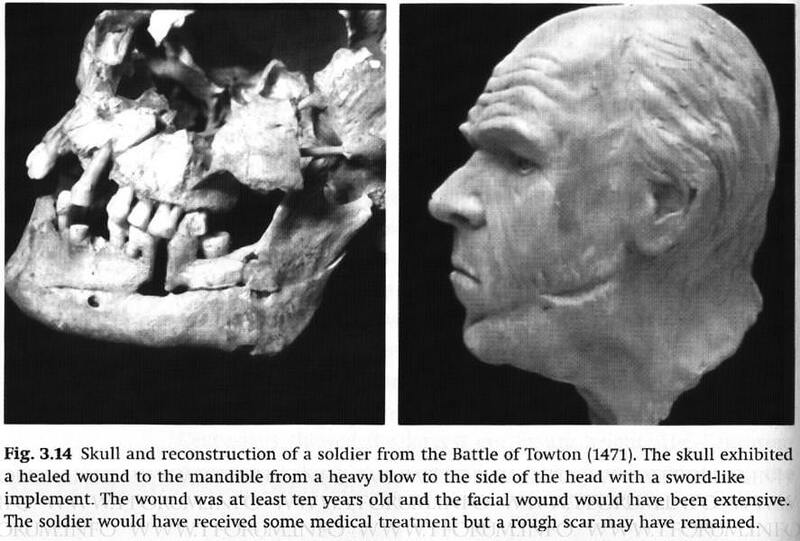 The skull (left) of a warrior shows was crushed. The soldier had survived battle before. A healed skull fracture points to previous engagements. He was old enough—somewhere between 36 and 45 when he died. He suffered eight wounds to his head that day. The precise order can be worked out from the direction of fractures on his skull: when bone breaks, the cracks veer towards existing areas of weakness. The first five blows were delivered by a bladed weapon to the left-hand side of his head, presumably by a right-handed opponent standing in front of him. None is likely to have been lethal. The next one almost certainly was. From behind him someone swung a blade towards his skull, carving a down-to-up trajectory through the air. The blow opened a huge horizontal gash into the back of his head—picture a slit you could post an envelope through. Fragments of bone were forced in to his brain. His enemies were not done yet. Another small blow to the right and back of the head may have been enough to turn him over onto his back. Finally another blade arced towards him. This one bisected his face, opening a crevice that ran from his left eye to his right jaw. In 1868 a farmer began to dig into the mound Bjerringhøj at Mammen near Viborg. During this work he chanced upon an unusually richly-furnished grave, which has become known as the grave from Mammen. A magnate was buried in the grave during the winter of 970-71 AD. He was given an expensive costume, a ceremonial axe with inlaid silver decoration and a large wax candle. The buried man lay upon a bed of down cushions in a coffin placed in a wooden chamber – a so-called chamber-grave. At his feet lay two axes. On the coffin lid a bronze bucket, two wooden buckets and a large wax candle had been placed. The man wore costly clothing decorated with purple and red silk, as well as embroideries in red and blue. It is not known whether the deceased was Christian or pagan. The motifs on the one axe can be interpreted as both of these, but the large candle is probably a Christian symbol. The fine quality of the furnishings shows that the deceased presumably belonged to the circle around King Harald Bluetooth. 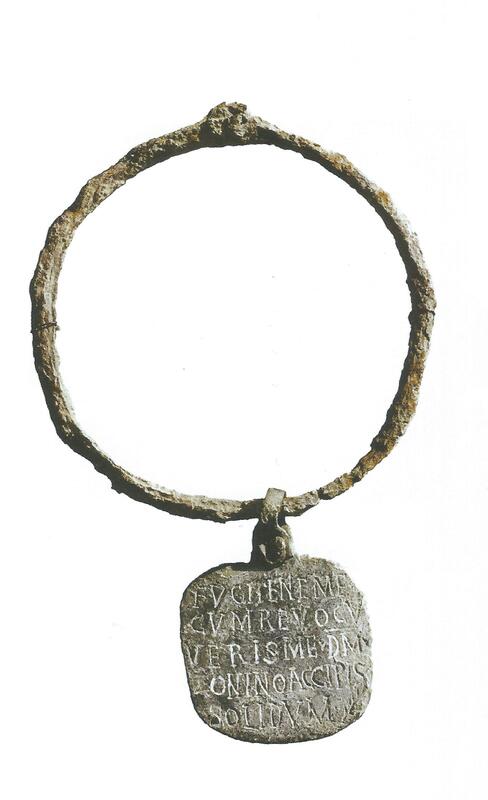 One of the most magnificent finds from the Viking Age is one of the axes from the grave at Mammen. It is made of iron with silver inlay. 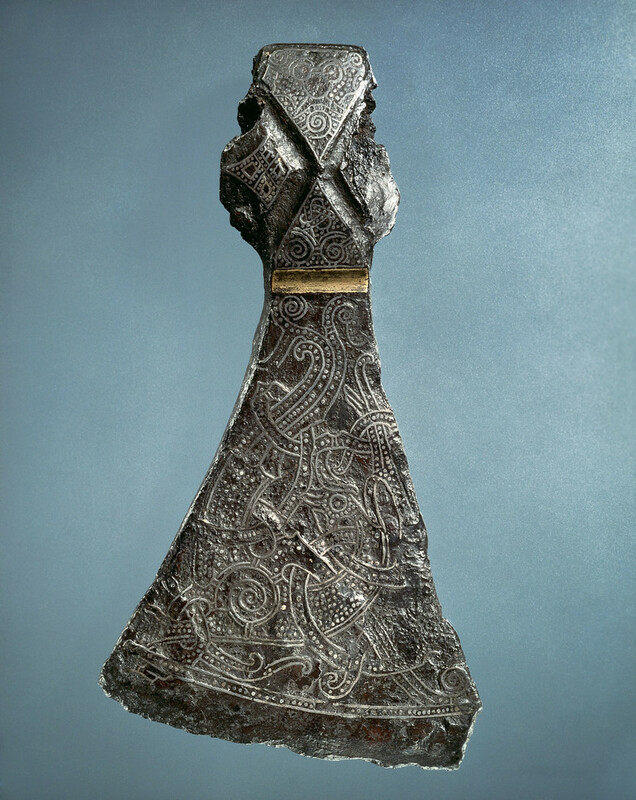 The axe is decorated in the so-called Mammen style, which is named after this particular find. The style arose in the 900s and it survived until around 1000. 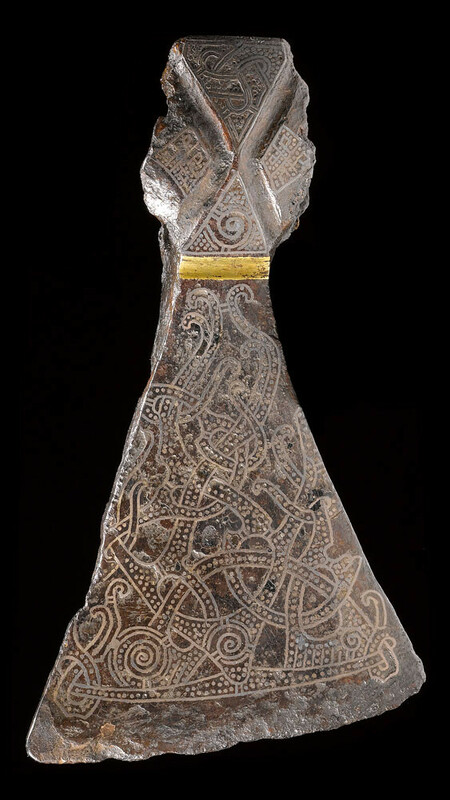 The motifs on the axe can be interpreted as both Christian and pagan. On one side a tree motif can be seen. It may symbolise the Christian Tree of Life or the pagan tree Yggdrasil. On the other side is an animal figure – perhaps the rooster Gullinkambi (Old Norse “golden comb”) or the Phoenix. According to Norse mythology Gullinkambi sits on top of the tree Yggdrasil. Here it wakes the Viking warriors every morning and it will crow at the beginning of Ragnarok (the end of the world). The Phoenix is a Christian mythological animal and a symbol of re-birth. Are you ever bored? What do you then? What would you do if you were Viking sailing for days on a small ship? Life of a Viking was... monotonous. Living in small towns, looking after their farms and preparing for another military campaign. When they were ready, they went on their warships to sail for many days. 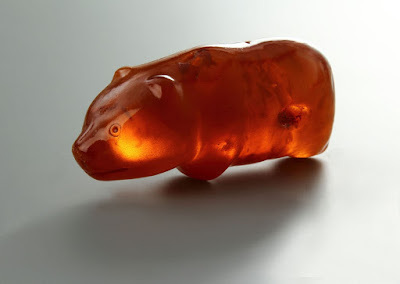 One of the most amazing artifacts ever found is barely visible. 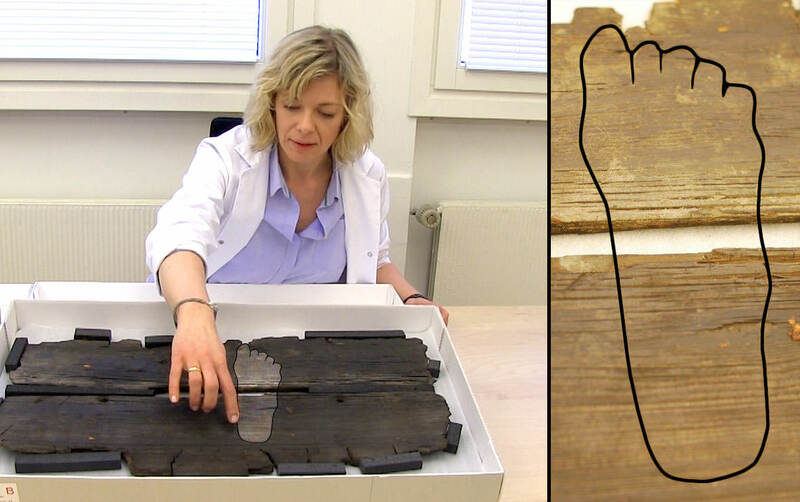 On two wooden planks you can see small carvings which are... outlines of feet. 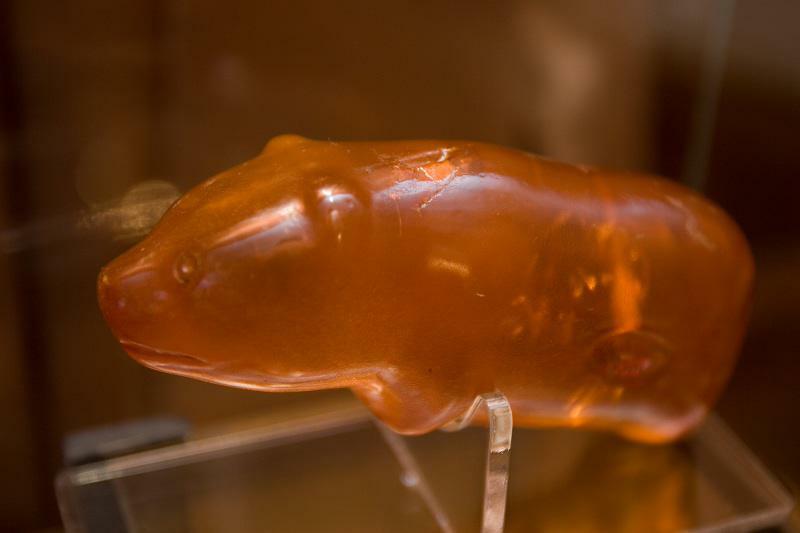 Mighty Gokstad ship was found in found in a burial mound in Norway. It is one of the largest viking ships found. The Gokstad ship is clinker-built and constructed largely of oak. The ship was intended for warfare, trade, transportation of people and cargo. The ship is 23.80 metres (78.1 ft) long and 5.10 m (16.7 ft) wide. The ship was built to carry 32 oarsmen, and the oar holes could be hatched down when the ship was under sail. It utilized a square sail of approximately 110 square metres (1,200 sq ft), which, it is estimated, could propel the ship to over 12 knots (22 km/h; 14 mph). The ship could carry a crew of 40 men but could carry a maximum of 70. 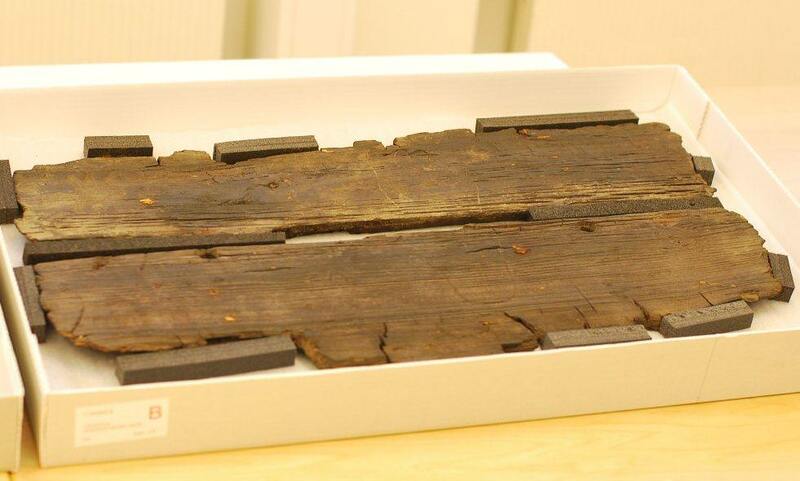 Even though the ship was excavated 133 years ago and has been in Oslo’s Viking Ship Museum since 1932, researchers only noticed the footprints in 2009 when moving the loose floorboards. Two small carvings was probably the work of a bored youth, much like kids these days might carve their initials into their desks. The right foot is quite visible while the outline of the left foot is only partially visible. The right foot is 22 centimeters long, which corresponds to shoe size 4 (Europe; 35). We believe that those carvings were made during sailing by some bored, young warrior just like modern teens do. He wass crowded into a sleek sailing ship with 65 other men. Scarcely room to move. It’s been days since anybody has seen land − longer since anyone bathed. The old-timers’ repeated tales of bygone raids and voyages are beginning to wear thin. His place is behind an oar, but there is no need to row continuously on the North Sea. With wind in the sail, the boat surges towards England, where riches await. 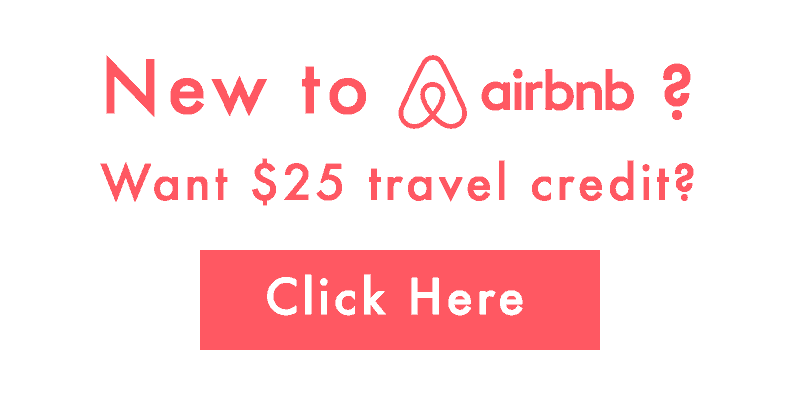 But what is there to do while waiting to reach a foreign coast? Maybe it was a teenager engaged in a Viking version of tagging a school desk. In any case, someone took out his knife, bent down and traced the outline of his foot on the deck of the Gokstad Ship. "I was here" message from 1100 years ago.